This pricey upgrade to the Rachio 3 smart sprinkler controller extends your system’s capabilities, but only a little. Irrigation systems don’t have the best reputation for being user friendly. Adding a smart controller like Rachio’s to the mix goes a long way toward improving the user experience. Now Rachio is extending the intelligence of its top-notch controller one step further with its Wireless Flow Meter accessory. The Wireless Flow Meter is a device that must be physically installed inline in your irrigation water supply plumbing. Unlike running sprinkler heads from an irrigation tube, this is not a trivial undertaking, and even Rachio recommends a professional install the meter for you. It was certainly well beyond my plumbing skills—particularly given that the pipes leading to my irrigation valves were 1/2-inch in diameter, but the Flow Meter only works with pipes that are 3/4- to 1-inch in diameter. This necessitated a complicated installation that sized the pipe up from 1/2-inch to 1-inch, then running through the Flow Meter, then sizing back down to 1/2-inch pipe to connect to the control valve. Figuring all this out and getting an irrigation specialist to my house to install everything took nearly a month of planning with Rachio (but just a 30 minutes of actual work). The finished product works well, though there’s a real Frankenstein appearance to the completed installation. 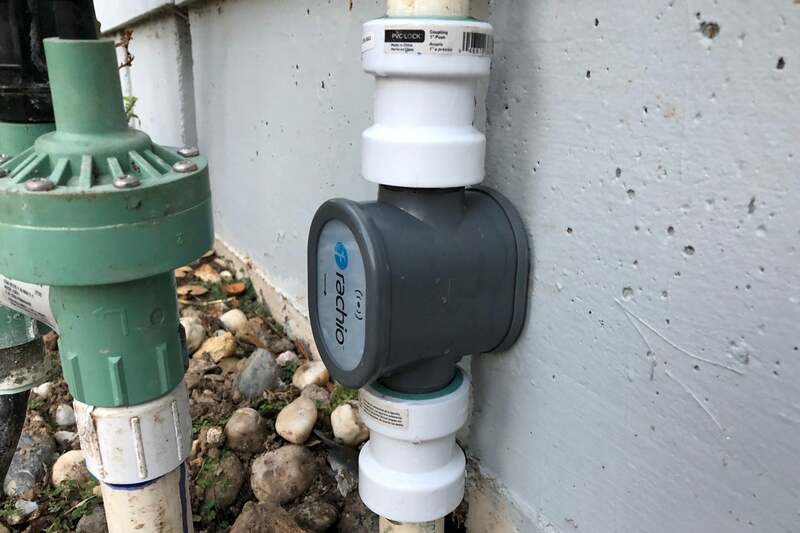 Installing Rachio's Wireless Flow Meter on my irrigation system required a couple of adapters because the meter is designed to fit pipes that are 3/4- to 1-inch in diameter. Once installed, you pop in two AA batteries (two years of life is specified), screw on a weatherproof plate (the unit is designed with outdoor use in mind), and add the accessory to your system within the Rachio app. From there it quickly syncs up with the controller. A brief calibration gives the Meter a baseline of water usage when the system is running. Note that the Flow Meter is compatible only with the Rachio 3 controller, with which it communicates directly over an unlicensed LoRa band. If you have an older Rachio, there’s no upgrade path to make the Flow Meter compatible, and the Flow Meter really can’t do anything on its own. You’ll notice that the primary water usage meter in the app reports usage in gallons, rather than in hours and minutes as it does without the valve installed. If you’re accustomed to thinking about water usage based on time rather than volume, this can be counterproductive, but the history section of the app still notes watering runs based on time, not the physical amount of water flow. 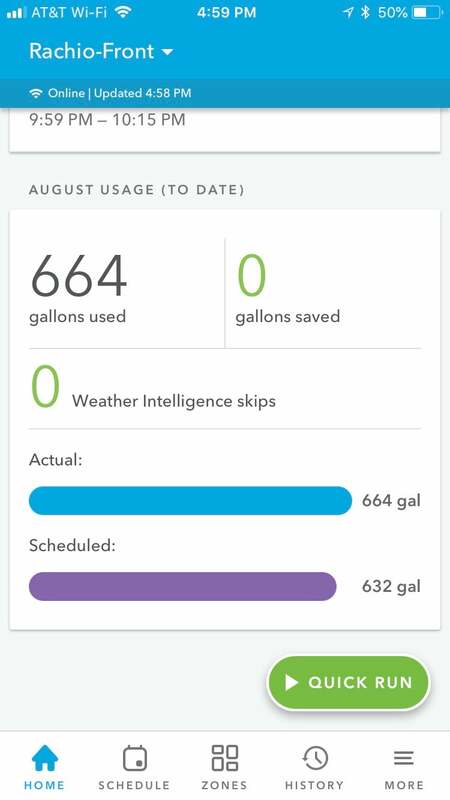 With the Flow Meter installed, the Rachio app displays water usage by in gallons. In day to day use, counting gallons is all that the Flow Meter does—unless there’s a problem. The calibration process sets a maximum water flow for your environment, and it monitors what happens during watering runs. If too much water is coming out, which would primarily happen if the line had a break somewhere, the Flow Meter is supposed to instruct the Rachio controller to stop watering. If you have multiple zones connected to the controller, the Meter is supposed to be smart enough to only shut down the leaky zone and let the other zones continue unabated. These types of leaks are common—usually because a coupling between two hoses failed or an animal chomped through some tubing—and often they aren’t detected until you notice that water is not reaching the plants it’s supposed to, because it’s flooding out somewhere else down the line. The problem: In my testing, the Flow Meter didn’t detect the leaks I simulated by breaking the irrigation tubing. Even though water was gushing out from the line, full blast, during a watering run, the controller allowed the watering cycle to complete normally, with no notification that there was a leak, and no aborting the run. Now, this could be a quirk of my system, as the volume of water flow through my tubing could be the same whether there’s a leak or not, so the Flow Meter may simply not have been able to detect it. How typical that might be of other irrigation setups, I don’t really know. The other big problem with this concept is that leaks don’t always occur while your system is running. If the control valve breaks and begins leaking, the Flow Meter won’t detect it, even though water is running when it shouldn’t be. And of course, if a leak develops in the system somewhere before water reaches the Flow Meter, it won’t be able to detect that, either. All of that limits the utility of the Flow Meter quite a bit. In other words: If you use a lot of water, don’t regularly verify that plants are receiving said water, or have a highly sensitive irrigation environment, the Rachio Flow Meter might make sense. For more casual users, I expect the cost and the complexities of installation and its significant number of limitations will make it a tough sell. 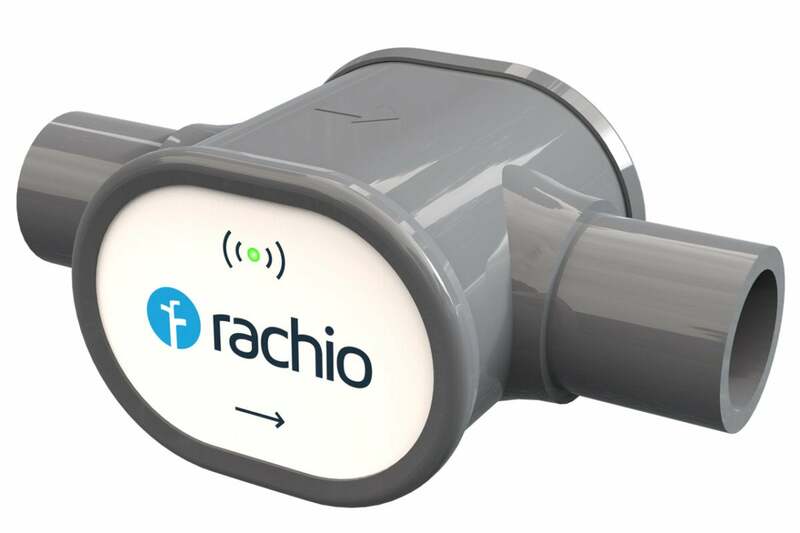 This story, "Rachio Wireless Flow Meter review: A watchful eye for irrigation leaks" was originally published by TechHive.